Metal Nanostructures for Photonics presents updates on the development of materials with enhanced optical properties and the demand for novel metal-dielectric nanocomposites and nanostructured materials. 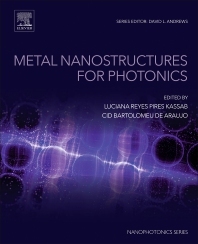 The book covers various aspects of metal-dielectric nanocomposites and metallic-nanostructures and illustrates techniques used to prepare and characterize materials and their physical properties. It focuses on three main sections, nanocomposites with enhanced luminescence properties due to contributions of metal nanoparticles hosted in photonic glasses, near and far-field optical phenomena, and the optical response of single nanoparticles that reveal quantum phenomena in the nanoscale, amongst other topics. This book will serve as an important research reference for materials scientists who want to learn more on how a range of metallic nanostructured materials are used in photonics. Luciana Reyes Pires Kassab has 25 years of research experience, and her research interests include plasmon assisted efficiency enhancement of rare-earth doped glasses covered solar cells, new fabrication processes of pedestal waveguides for integrated photonics, studies of the plasmonic effects on the optical gain of rare earth doped waveguides for the first and third telecommunication window, influence of silicon nanoparticles on the photoluminescence and optical gain enhancement of rare –earth doped germanate and tellurite glasses, the nonlinear optical effects for ultrafast optical devices based on glasses with Au, Ag nanoparticles and with silicon nanocrystals.